The 5th March officially marks the start of British Pie Week. Celebrated around the UK, it’s officially an excuse to eat pie every day of the week for a whole week, with purpose. 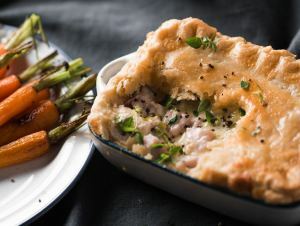 This is my recipe for a classic Chicken, Ham & Leek Pie and it’s one of my favourites. Growing up, my parents had a large family to feed, which meant the filling had to go that little bit further. I always remember my going round to my Grandma’s for dinner and the pastry top was almost thicker than the contents of the pie. She’d laden the filling with plenty of liquor (gravy!) that would be soaked up into the underneath of the pie top, creating the most perfectly juicy but crisp pastry.. If you’re looking to bulk out your filling, add hardy vegetables to the mixture. Broccoli stems, potato, parsnips and carrots are perfect, as they’ll cook in the heat of the gravy. Anything too delicate and soft with just wither away. Leek is a little bit like this, but it’s more of a flavour enhancer than texture with this recipe. Carrots are pretty much in season all year round in Britain, and even if you’re shopping at your mainstream supermarket, they’re bound to be British. 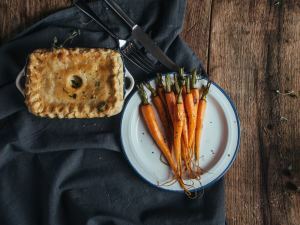 Serve with whatever vegetables you please, but carrots add a delicious sweet accompaniment to this savoury pie. Cut the butter into small cubes and combine the flour, salt and fats together with your fingers to create a crumbly texture. Always make sure that when ever you’re making pastry you have clean, dry and cool hands, as you don’t want the mixture to become greasy. Stir in just enough water to combine the pastry together, wrap in clingfilm and leave until you’re ready to use. To cook the chicken, place on a rimmed baking tray and drizzle with oil, salt and pepper. Cook in a pre heated 180ºc oven for 1-1.30 hours until cooked. Leave to one side to cool. Place the ham hock in a sauce pan and cover with water. Bring to a rapid boil, remove from heat and discard the salty ham water. Place the ham back into the sauce pan and recover with 1 pint of cold water. Add the bay leaf, garlic, carrot, hardy head of the leek, thyme and celery. Gently bring to the boil and leave to simmer for 2 hours until tender. Once cooked, remove the ham from the water and leave to cool. Pass the stock through a sift, saving half of the stock, around 1/2 pint and place back into the sauce pan. Add the double cream, reducing the liquor on a rolling boil to reduce and thicken until it’s the consistency of gravy. Leave the liquid to cool before slicing the leek and tearing up the ham hock and chicken and adding together. To make the pie, remove pastry from fridge and split into two equal halves. Roll out the first half to around 3mm thick and large enough to cover a 23cm pie case. Carefully lay over the pie case leaving the overhang around the edges. Leave uncovered for 5-10 minutes to allow the crust to dry. This will stop the base becoming soggy. Place the chicken, ham and leek mixture into the pie tin and roll out the remaining pasty into a 23cm circle. Place the pastry on top of the pie, so it sits just inside the edge. Place a 1cm hole in the middle of the pie and fold in the edges, crimping and catching the top as you go around the edge. To make an egg wash, whisk the milk and egg together before brushing over the pastry, making sure you brush in-between all of the creases around the edge. You can make the pie ahead and cover with clingfilm. Place in the freezer or leave in the fridge if it’s just for a few hours or over night. To cook, place the pie into a preheated 160ºc oven and cook for 45 minutes. Keep checking your pie through the oven door, and if it starts to colour, turn the oven down to 140ºc and cook for a further 15 minutes, cooking for an hour in total. 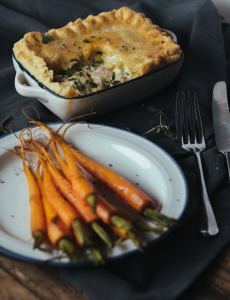 Serve with your favourite seasonal and locally sourced vegetables, making it the perfect British Pie Week celebratory dinner.